Your personality type is a detailed classification of the innate characteristics that make you who you are. There are a total of 16 personality types. Many of today’s theories of psychological typology are based on the work of Swiss psychiatrist Carl Jung, who wrote Psychological Types in 1921, and the research of Isabel Briggs Myers and Katharine Cook Briggs. Jung was the founder of analytical psychology, which studies the motivations underlying human behavior. Your personality type is determined by your Preferences. If, for example, your four dominant preferences are Extraversion (E), Sensing (S), Feeling (F) and Perceiving (P), your personality type is ESFP. No personality type is better than another. Each person has a unique set of equally valuable characteristics. Understanding your type can be useful in many ways, including relationships, career and learning. 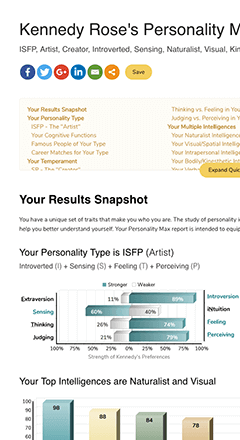 Take our Free Personality Test to learn what your personality type is. Your personalized report includes more than 20 pages about your personality type, preferences, Cognitive Functions and other aspects of your personality. You may optionally include Multiple Intelligences and Learning Styles. No registration is required. We recommend reading through the profiles below and studying the different preferences to be extra sure of your personality type since no test can determine type with 100% accuracy for every person. Our test serves as a tool to assist you in determining your type. There are 16 personality types grouped by Four Temperaments. Click a personality type to read a full profile. The Protector personality types are observant, stable and motivated to maintain security. Reliable, diligent and industrious, they make excellent leaders. ESTJs are responsible, logical, norm-following hard workers. Their efforts are carried out in a practical, structured manner. ESTJs trust facts and experiences more than theories. They are decisive, loyal, tradition observing individuals. They enjoy being the person in charge and often make good supervisors. ESFJs are social butterflies that value relationships, supporting and nurturing others. Never one to shy away from social events, they are often the host. They are great encouragers of teamwork. ESFJs are responsible, dutiful, traditional and follow rules. ESFJs have deep concern for others. ISTJs are responsible, loyal and hard working. They have an acute sense of right and wrong and work hard at preserving established norms and traditions. Because of their deep sense of duty they are dedicated to everything they do and are very dependable. ISTJs care deeply for those closest to them. ISFJs are traditional, loyal, quiet and kind. They are very sensitive to other people’s needs because they are very observant. They have rich inner thoughts and emotions. They value stability and cultural norms. They are very adept at giving attention to detail. They do not seek positions of authority. The Creator personality types are observant, experiential and primarily driven by sensation. They are flexible, aesthetically-aware, “here and now” people. ESTPs are action-loving, “here and now” realists with excellent people skills. Informal, risk-taking, fast-paced and adaptable, they are not always in agreement with rules and regulations. They are tactical problem solvers that desire quick results. ESTPs, who present a friendly and enthusiastic face, are straight shooters that are able to handle criticism. ESFPs are cooperative, “here and now” people-persons that enjoy excitement and love new adventures. Because of their highly social nature, they are especially lively when they are the center of attention and hate being alone. ESFPs have a practical side that allows them to finish work efficiently and are often good problem solvers. ISTPs are adventurous and independent. They like to figure out how things work. They have great mechanical and technical skills. They live in the “here and now” which makes them adaptable and spontaneous. They like to keep busy and are action-oriented. ISTPs thrive on new and exciting situations and often excel at athletics. ISFPs are artistic, creative, loyal and sensitive. They have a keen appreciation for beauty because of their highly developed senses. They are easy to get along with and live in the “here and now”. ISFPs are adaptable, caring, independent and like to contribute to the well-being of others. They are typically hard to get to know. The Intellectual personality types are introspective, logical and on a constant quest for knowledge. NTs are abstract, theoretical and technically adept. ENTJs are strategic, organized and possess natural leadership qualities. They are master coordinators that can effectively give direction to groups. They are able to understand complicated situations and quick to develop solutions. They are decisive and value knowledge, efficiency and competence. ENTPs are logical, innovative, curious and downright inventive. They see possibilities for improvement everywhere and possess the ability to understand complex concepts. ENTPs are introspective and carefree nonconformists. ENTPs can be good conversationalists and are exciting company. INTJs are introspective, analytical, determined with natural leadership ability. They prefer to stay in the background while leading. Strategic and adaptable, INTJs are talented at bringing ideas from conception to reality. They can also be described as decisive, open-minded, self-confident, attentive, theoretical and pragmatic. INTPs are logical, individualistic, reserved, and very curious individuals. They focus on ideas, theories and the explanation of how things work. They are especially adept at discussions and debate. They have the ability to focus intently on a subject. They appreciate and respect intelligence in others. The Visionary personality types are introspective, intuitive and highly idealistic. They are compassionate people that desire to contribute goodness and meaning. ENFJs are externally focused, introspective, altruistic, positive and have excellent people skills. They are warm and have a natural desire to be supportive and encouraging. Being charismatic and possessing excellent language skills, they do well in leadership roles. ENFJs strive to enhance the lives of their human brethren. ENFPs are introspective, values-oriented, inspiring, social and extremely expressive. They actively send their thoughts and ideas out into the world. They are natural advocates, attracting people to themselves and their cause with excellent people skills, warmth, energy and positivity. ENFPs are described as assertive, spontaneous and experimental. INFJs, making up an estimated 1% of all people, are the most rare type. They are introspective, caring, sensitive, gentle and complex people that strive for peace and derive satisfaction from helping others. INFJs are highly intuitive, empathetic and dedicated listeners. These traits tend to act as a “tell me what’s wrong” sign on their forehead. INFPs are introspective, private, creative and highly idealistic individuals who have a constant desire for meaning. They are driven by their values and seek peace. Empathetic and compassionate, they want to help others. INFPs are imaginative and creative. They can also be described as easygoing, selfless, guarded, adaptable, patient and loyal. The personality types themselves are just the beginning. Dig into preferences, cognitive functions and some fun resources with these articles. Each personality type belongs to one of four temperaments (SJ, SP, NT, NF). For example, INFP belongs to NF. Temperament can be thought of as the “big picture” of your personality. Preferences are a way of classifying a person’s natural tendencies. There are four pairs of opposing preferences (e.g. Extraversion vs. Introversion) for a total of eight. A person will lean more toward one than the other. Each personality type engages the world through four cognitive functions. Each function is directed outward toward people and surroundings (Extraverted) or inward toward a person’s thoughts (Introverted). A list of personality types of well-known people. Personality types of fictitious characters from books, movies, etc. The frequency of each personality type by population and by gender. 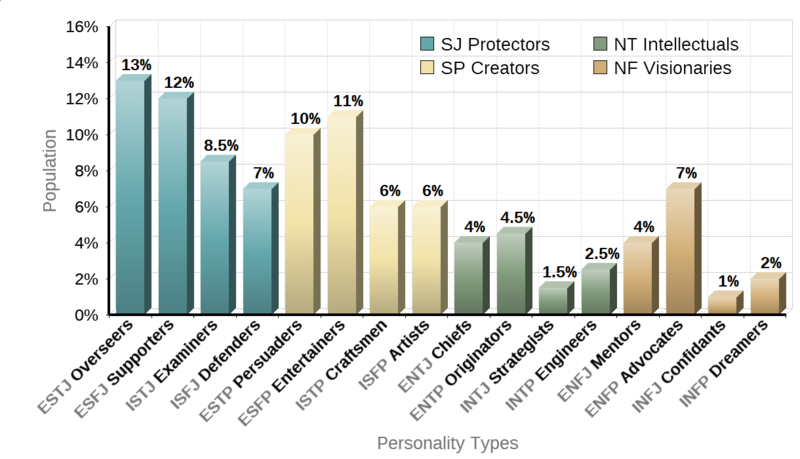 Careers of interest for each personality type. Take our Free Personality Test to receive 20 pages of personalized results with more than 30 charts. We believe it is the best personality test online today. No registration required. Personality Max’s Personality Test has no connection to, and should not be confused with, the MBTI® Assessment.